The Powered by ZOMONGO Sweepstakes (camaro.poweredbyzomongo.com) is open to legal citizens of United States (excluding residents of Florida and New York) or Canada (excluding residents of the Quebec province) who are at least eighteen (18) years of age or the age of majority, whichever is older, in their respective state (or province) of permanent residence. The Powered by ZOMONGO Sweepstakes ends at 11:59:59pm ET on December 31. Entrants can enter the Sweepstakes by visiting camaro.poweredbyzomongo.com and completing the Sweepstakes registration form. Limit eight (8) total entries per entrant. One (1) Grand Prize will be awarded. 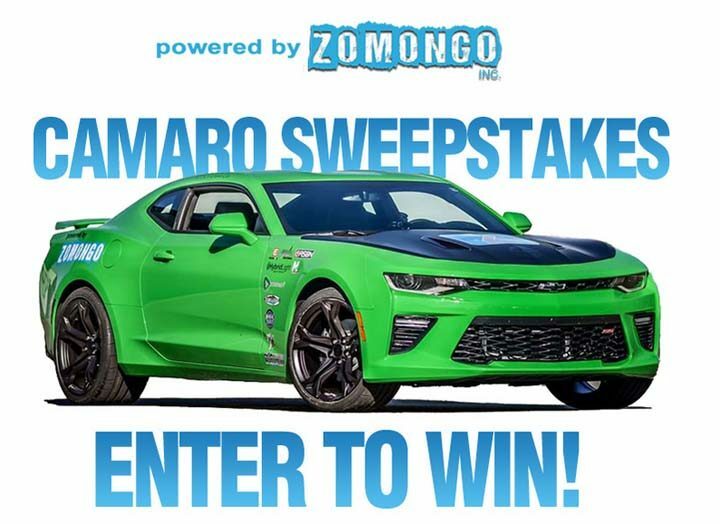 The Grand Prize Winner will receive one (1) 2016 ZOMONGO-branded Chevy Camaro. The Approximate Retail Value (“ARV”) of the Grand Prize is $35,000 (USD). Green and black to 60 in 4.0 seconds. Today is my luck day! Need new wheels my car is 13 years old! Green and Black is cool! I always wanted a Camaro. It would be great to win it.